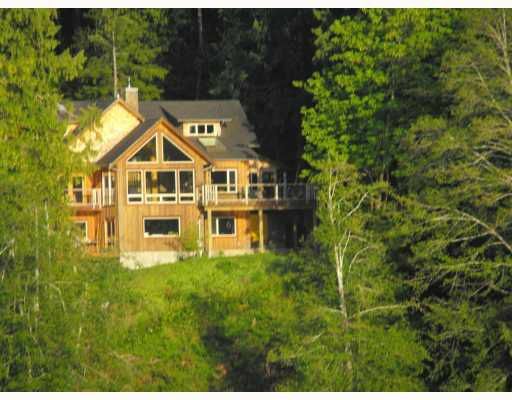 Custom crafted, 3400 sq ft timber frame, waterfront home. Situated beside Davis Brook Creek, easy access to your own sandy beach. .75 acres. This spacious home features 4 or 5 bedrooms, 4 baths, dramatic vaulted ceilings and log posts andbeams. Open island kitchen with pantry overlooking views up Sechelt Inlet. Hobby room, sun room, big deck, one bedroom suite. Alder and hemlock floors, Mexican tile and custom rock work throughout. Master suite offers fireplace, private patio, custom crafted ensuite. Listen to the creek, such a tranquil setting, close to marina. 10 mins from Sechelt. New driveway and 1/18 ownership in common Lot 6 waterfront.